I don't mean to brag but I think I'm kind of getting the hang of this grilling thing! Don't let my drunk beer-can chicken fool you! I've been wanting to make this recipe for awhile, which was provided by the chef at Root Down in Denver. I had the chance to eat there several months ago during a business trip and was blown away by how good the food was. It's received a lot of accolades and frankly deserved every single one. It was a very memorable meal. It was almost a perfect meal actually. So when Bon Appetit published this green curry pork tenderloin recipe, I knew I wanted to make it—even though it would involve grilling the meat. And for some reason, I knew I wanted to make it for a party. While I know it's not recommended to serve something at a dinner party without having tried the recipe before, I've honestly had good luck with that in the past. Maybe it's beginner's luck? Having said that, I usually pick pretty straightforward stuff—nothing with unfamiliar ingredients or overly complicated steps. 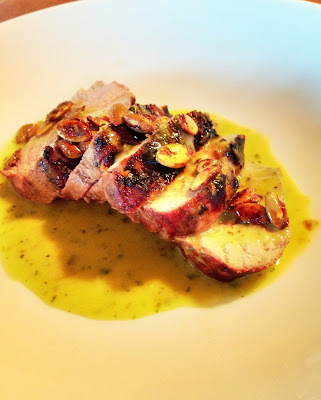 But I do suffer from perfectionism, so spent a good chunk of time researching the best way to grill a pork tenderloin. The rest of the recipe—overnight marinating, making the curry sauce and cumin-spiced pumpkin seeds—didn't ruffle my feathers. It was grilling the meat that kept me up the night before the party. I'm sure to many, that would be the easy part. 1) Turn the grill on high and let it warm up for 10-15 minutes. 2) Place the tenderloin on direct heat and cook with the lid closed for 7 minutes. 3) Turn the tenderloin over and cook with the lid closed for 6 minutes. 4) Turn the grill off and let the tenderloins sit with the lid closed for another 5 minutes. 5) Take them off, let them rest for another 10 minutes, slice and you will be guaranteed to have a perfectly cooked tenderloin. I am now an evangelist about the 7-6-5 method and would challenge anyone to find an easier and more successful way to grill a pork tenderloin. The meat was so succulent. I would say "moist," but for some reason, that word really grosses me out. It's up there next to "runny." Anyway, you can see in this photo how juicy the meat is. It is glistening. The funny part about the experience was that the kids in attendance kept asking what we were having for dinner. It was not the likely candidates of burgers, hot dogs and chicken breasts they probably more often associate with the grill. So when I told them pork tenderloin, they gave me confused looks. Finally I said, "Do you like bacon?" I got an overwhelmingly positive response, so I told them we were going to be eating something like bacon. That seemed to alleviate any concern they had over the mystery meat. In fact, they chowed down on it, even though I served theirs without the curry sauce because I didn't want to push my luck. But that curry sauce. . . . Oh my. It was delicious. I wanted to just put a straw in the sauce and drink it. It was the right amount of fresh (from the cilantro and lime juice) and spicy (from the curry paste) and sweet (from the coconut milk). 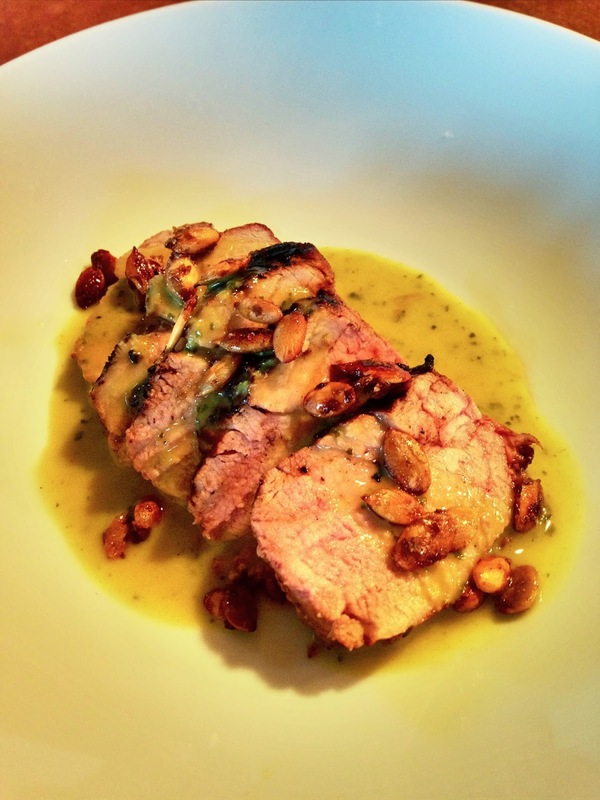 It was really a beautiful amalgamation of flavors that struck just the right chord. It was "cleaner" and more elevated than a curry you might get from Thai take-out but exotic and different enough to make it feel special. People seemed to really love the crunch from the cumin-spiced pumpkin seeds but to me it was a nice to have not a must have. It makes plenty, though, and I did enjoy crunching on them throughout the following week. I served the meat along side this spicy Asian noodle salad that was frankly ridiculous. We inhaled it and several kids asked to take left-overs home (there were leftovers because I have a phobia that I won't make enough food for parties so always make about double what is needed). I used fresh linguini as the base and coated the noodles with a spicy soy and peanut butter sauce. I didn't take many photos of it though. Sorry, so you'll have to trust me that it was the right amount of crunchy, bright, and spicy and a perfect accompaniment to the meat. But some jasmine rice would also be an excellent choice and great for soaking up the sauce. Actually I didn't take many photos of anything for this post. That's the downside of cooking for a crowd—it's hard to run around snapping food pictures when you're trying to get everything on the table. 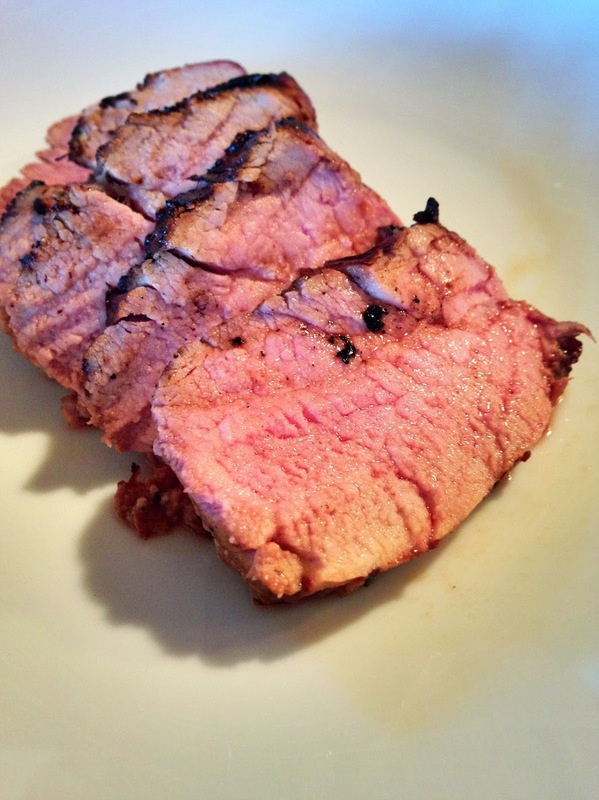 I have since used the 7-6-5 technique several times and have become a staunch believer that it is THE WAY to grill tenderloin. And I feel equally confident that this is a damn good recipe. So even if you're a little grill-shy like me, I would encourage you to give this a try. It's fragrant, it's delicious, it's different but something you'll want to eat over and over again. And people will shower you with compliments and make you feel like you're a fabulous chef, even if the kitchen—or grill—is usually not your strongest suit. Note: Yes, it's recommended that you marinate the meat overnight, but a few hours will totally do the trick, and the curry sauce comes together very quickly even though it seems like it has a lot of ingredients and steps. It easily doubles and triples! The seeds can be made several days in advance and kept in a tightly sealed container. You can probably make the sauce a day ahead too. It certainly makes plenty and I used it on other dishes on subsequent days and it still tasted amazing. 1. Combine soy sauce, orange juice, maple syrup and sesame oil in a large resealable plastic bag. Add pork and seal bag. Chill, turning occasionally, at least 8 hours or up to 1 day. 2. When ready to grill the meat, prepare grill for high heat. Remove pork from marinade; pat dry. Grill pork for 7 minutes on one side with the grill lid down. Turn the pork over and grill on high for another 6 minutes. Turn the grill off and leave the meat on the grill with the lid closed for another 5 minutes. The meat should be cooked to 140 degrees. Let rest 10 minutes and then slice. 3. 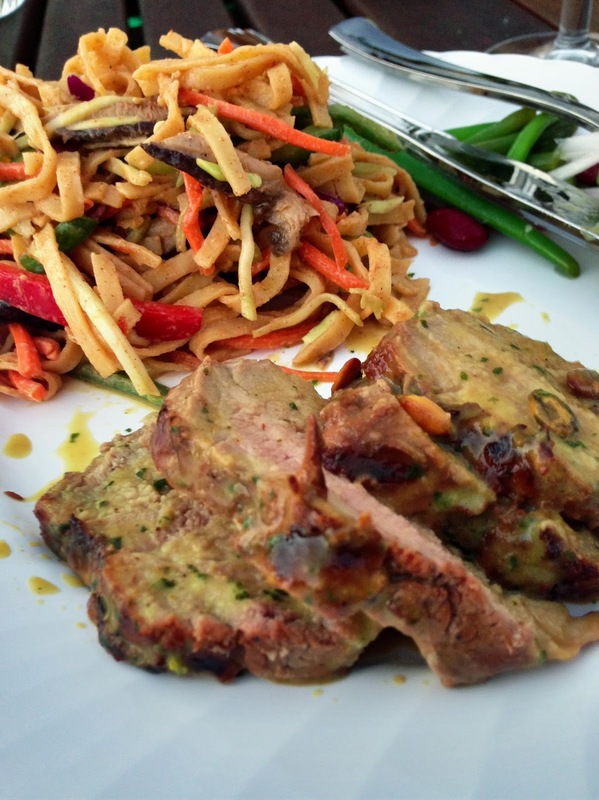 Slice the pork and serve with curry sauce and cumin-spiced pumpkin seeds sprinkled on top. 1. Heat oil in a large skillet over medium-high heat. Add pumpkin seeds and toast, shaking the pan often, until the seeds are brown, about 4 minutes. 2. Add cumin seeds, then gradually add sugar, then lime juice, tossing constantly to coat seeds with melted sugar and juice. 3. Transfer pumpkin seed mixture to a foil-lined baking sheet; spread out and let cool. Season with salt. 1. Heat 1 Tbsp oil in a medium saucepan over medium heat. Add shallot and garlic and cook, stirring often, until softened, about 3 minutes. Add curry paste and lime zest and cook, stirring constantly, until fragrant, about 1 minute. 2. Add coconut milk and bring just to a boil, stirring and scraping up any browned bits from bottom of pan; reduce heat and simmer, stirring occasionally, until mixture is reduced by half, 10-15 minutes. Remove from heat and let cool slightly. 3. Transfer coconut milk mixture to a blender. Add cilantro, lime juice, brown sugar, and 2 Tbsp water and blend until smooth. With motor running, drizzle in remaining 2 Tbsp oil and blend until creamy. Season curry with salt and pepper, return to pan and cover to keep warm. All rights have been earned! Yummy!